We frequently write about the ways of creating websites (business sites, online stores, blogs etc.) and the services that can be used for this purpose. We also test different platforms, defining their benefits and drawbacks comparing to the competitors. However, we rarely focus on the basics of promoting these services. We just mention the set of SEO tools of a certain website builder and that’s it. Obviously, this is supposed by default as you create a website and then have to attract the audience. But how? That’s a pretty good question. Many specialists get the experience of SEO, when working in the niche for years. You cannot learn this for a day or a week as you will see the result of your actions in about several months or so. Nonetheless, there is a list of steps you should make to potentially increase your chances for successful promotion of your website in Google. Why do we talk about the possibility of effective website search engine optimization only, when we definitely need a surefire result? Unfortunately, this is hardly possible as we always face the need to withstand niche competition. What’s more, the quality of websites and the professionalism of a SEO master may notably vary as well. Your success rate depends upon the quality of SEO services provided. We’ll see the major principles of internal and external website optimization on the example of websites created with Wix. What you should know is that SEO of Wix-based websites doesn’t technically differ from that of websites launched with other platforms. So, we can rightfully call this guide universal. When it comes to the set of on-page website optimization (by code, content, settings), we can subdivide all the steps into two groups, namely technical and content parts. Let’s describe each of them in details. This part of the on-page website optimization goes down to filling out the meta tags (titles, descriptions, keywords), web page URLs and optimization of images with the purpose of decreasing their size to speed up the loading of website pages. The process also involves the measures aimed at increasing the speed of web page loading, UI management, mobile optimization of templates, set up of system files and website pages. Many things are set by default in Wix. For example, the chosen template defines usability and the set/variants of widget settings, which partially prevent hectic combinations. Proper filling out of meta tags implies the use of keywords that are relevant to a text/website and help the search engines understand the essence of the content and the audience it is meant for. Obviously, the title (60-80 symbols) may contain the explicit form of a keyword like “How to Cook a Medium Rare Steak|Steakhouse.wow|New York”. You can see this title in the search engine results, where each word is capitalized. You can make various additions to it though the following symbol «|». This can be a website domain for better memorization, location, service/product price, focus on quality, important terms etc. Description (the optimal length of which should be around 160-290 symbols) serves as a web page announcement, which shows in the search engine results under a certain title. It is desirable that keywords should come with certain content, but don’t go too far with it – the text should be readable and create a selling impact. Finally, the keywords should be chosen by rating in specialized services like Google Keyword Planner. Mind the keyword popularity and try to apply both the head and long-tail queries, but don’t overuse them. How to Set Up Title and Description on Wix Website? You can access SEO settings in the “Web Pages – Website Menu” section of Wix editor by clicking the «…». This is where you can add a title, description, keywords and change the human-friendly URL. You will be shown the way your web page format will look in the search engine results in the preview mode. You can also get to the SEO Wiz from here – this is the tool, which lets you connect Google Analytics, check your website readiness to promotion by certain criteria and get quick links to complete the optimization of the required elements. The SEO section contains a perfect website optimization guide. By following the recommendations of Wix SEO master, you can create perfect effect without any extra guidelines. Actually, website builders rarely allow launching websites and providing the tips on its further promotion at a time. By clicking any position, you will find out what makes this or that action important and where it can be done. Google doesn’t currently recognize image content. That is why, it is obligatory to fill out the Alt tag for each image (open image settings, add its title and description). This is how you can help a search engine understand the essence of the image and index it properly. What’s more, this is a great way to insert extra keywords by context without affecting its readability and overspamming. Sometimes, users look for images on their own and a properly filled out Alt tag allows them to get to your website. Images should be optimized by their size and quality. By uploading a photo directly from your camera without any editing, you run a risk of slowing down the loading speed of web pages, where this image will be published. This will eventually impair the behavioral website parameters, search engine attitude and final search engine results. So, you have to edit the pages before you upload them to the website by compressing them with minimal quality loss. This can be done here or in any other convenient way. The system creates the sitemap.xml and robots.txt files automatically. You can view their content by adding a title of one of these files with a «/» sign after a domain name. They don’t matter a lot in this particular case. However, the availability of the website mobile version is one of the major factors of high Google search engine ranking. Wix allows creating mobile design separately from the basic one. You will get it by default, even if you don’t change anything. Creation of human-friendly URLs is a crucial nuance. The address line of the browser should contain a phrase, which reflects the web page context. It is desirable that it should contain a keyword. Each web page in the address line should be a single phrase, but not a combination of senseless letters and numbers. There should not be web pages with similar URLs at the website. Meta tags (title, description, keywords) should also be unique on each web page – it is inadmissible to assign the same title and description to all pages at a time through Ctrl+C/Ctrl+V button combinations. To separate words in a human-friendly URL, we recommend to use the signs like «-» or «_». Make up signatures for each image according to its topic prior to uploading it. For example, write «night-forest.jpg» instead of «0983764.jpg» etc. This is how you will get a normal human-friendly URL when opening the image. This information is meant both for a user and the search engines. There is also website pages interlinking. This is a way of connecting website pages by using interlinking. It is nice, if you use several anchor links to other web pages similar in context in the body of the material. Just make sure you don’t overload the text with links. Use them wisely and consistently. You may also read a complete Wix SEO review. It is desirable to make web page content optimized for the keywords. The ideal variant is when each page is written for one keyword only, but this doesn’t happen often on practice. 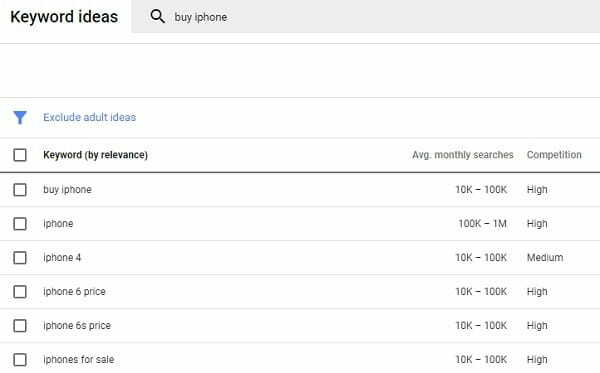 If you open Keyword Planner and write the “buy iphone” phrase, for example, you will see a variety of formulations of this search engine query in the order of their popularity decrease. Keywords found on the top of the list – are head queries as the users of the search engine have used them as they are during a month. Keyword frequency differs as well. For example, the maximum number of your keyword use has constituted 1000. Keywords from 750 and up to 1000 times are frequent, those ranging from 400 times are medium and keywords used from 300 times are the lowest. This is the approximate percentage rate that may help you understand the situation. However, it is quite vague as the numbers will still differ for each website. Place keywords on the same principle – popular ones at the beginning of the page, while rare ones – in the end of it. The optimal amount of key phrases found on a page depends upon the size of the text. Oversaturation of a web page with keywords is known as overspamming. As a rule, this affects the readability of the text and triggers the unfriendliness of the search engines. The approach to writing texts oversaturated with keywords was quite effective some time ago and helped websites quickly get to the TOP. Today, however, the situation has notably changed and this approach frequently has negative impact upon the search engine results. The thing is that the search engines have learnt to understand the context of the text. As a result, the notion of the Latent Semantic Index (LSI) was introduced several years ago. This is the method of analysis based on the relevance of thematic context. LSI texts differ from those, which are SEO optimized by the strong focus on the quality of topic development implied in the title, but not on the use of key phrases. We initially review the list of keywords on the topic of our web page. Based on the search query character, we can understand what the users are interested in. Then we learn the TOP list of the search engine results based on the queries to see what terms and approaches these articles use. The terms reflect the relation of a text to a certain topic. Having learnt the search engine results, we can eventually conclude what we should write about and what the the essence of the terms, which should be conveyed on the context of the material, is. The next step is preparation of a text with a more detailed topic coverage. On this stage, we use the niche terms, their synonyms, reveal their meaning, describe the processes, approaches, algorithms and other suchlike things depending upon the topic. If it is possible to add new shades of meaning regarding the TOPs of the search engine results, your web page will likely rank higher than that of your competitors (under other equal conditions, but there is no guarantee about that as well as there are other multiple search engine ranking parameters). As a result, we get user-friendly content, which will receive higher ranks in Google. Yes, You should be aware of the niche basics and have enough time to write such articles, but this is definitely worth that. This is the highest quality level, which is understandable both to users and robots. This is because we have already mentioned that the use of keywords to write an article on a certain topic is not quite necessary. In other words, a quality article is optimized for website promotion by default as it covers all the terms and title meaning in details. The next issue concerns a person, who will be responsible for content writing. Will you do it yourself or you will hire a copywriter for this purpose? It is not quite easy to realize all the above mentioned aspects from the technical point of view. You can be aware of the niche basics, understanding important nuances, but you may not just be proficient in writing. No one will value unreadable texts with mistakes, vague topic coverage etc. A nice article should encompass grammar and language proficiency, awareness of the subject matter, high readability level and, of course, appealing and quality web page design, including the important elements like fonts, lists, images, accents etc. This is the blend of skillfulness, utility and effective presentation. You can fill several web pages with suitable materials yourself. It’s not crucial, if they are not ideal, even though, they should be devoid of obvious faults. Eventually, the target audience rarely consists exclusively of linguists. You have conveyed the essence of the topic, provided the details, making the material understandable to readers and that’s it. This may take much time from an inexperienced user, but it can eventually be completed successfully. When to hire a copywriter? If you still need much text or you are going to sell/present something really expensive and meant for specific and demanding audience, then it makes sense to entrust this task to a copywriter. It’s a surefire thing that one user will leave the text as it is without caring about it at all, while a professional or a person with a sense of style will start criticizing or even laughing at poor content presentation. You’ll still have to find favor in the eyes of these people, especially if they form the basis of your target audience (this depends upon the niche). Generally, it makes sense to hire a copywriter, especially if you have a business website with several pages. Let them be readable and appealing! Now, let’s mention a couple of words about the unique character of texts. It’s inadmissible to use those articles, the unicity rate of which is lower than 80%. The problem is that randomly written texts are not unique because of a high amount of terms and titles, which cannot be replaced with other words. The problem may also be about low volume of technical texts oversaturated with the terms (the longer a text is – the simpler it is to make it unique). Another complication is similar nature of texts written at a time, which look like copied ones. The way out is to look for the synonyms, try to write differently, use equal proportions of keywords, terms and informative text. Is a Blog a Must for a Website? We highly recommend launching a blog. It is a must, especially for business websites and portfolios, which lack the text content. A blog allows boosting the volume of useful website content to further rank high in the search engines due to it. You will be able to make use of a long list of keywords, encompass multiple terms, cover the essence of everything, which cannot be mentioned in the service list, product description, company-related information etc. What’s more, websites that come with blogs, look more credible, which also boosts the behavioral factors. A user, who visits a website to read about the characteristics of winter and summer tyres, for example, may eventually place an order there. Niche articles is a power that attracts search engine traffic of informational character. They will serve a nice tool of converting visitors into clients, granted that you choose the right approach. At least, you will get extra traffic, which is also a notable advantage. When it comes to working with content, a website builder does not imply any special terms. Wix allows designing appealing web pages with diverse content types, including text, video, infographics, cinemagraphs, charts and other suchlike things. This is not a problem. What matters most is the quality of articles, which reveals itself in the detailed coverage of topics, readability, semantic and technical uniqueness as well as appealing formatting. Just take the keywords and write the texts using them. Another option is to entrust this task to copywriters, which will eventually trigger more advantages in a number of cases. Read also: How Much Does It Cost to Start a Blog? The entire essence of off-page website optimization goes down to getting links from trusted niche websites and those from other sources. This is one of the major factors of high search engine ranking of websites created with any website builder. Everything is logical here: the oftener other websites link to your website, the more valuable the information posted there seems. When someone recommends you, this gives you more credibility. This is the logic you observe in everyday life, which is revealed through the machine-based analysis of parameters. All the benefits of external optimization center around the ways of getting quality backlinks. Anchors and Direct Links. Speaking about the first group, its name speaks for itself. These links contain anchors, which generally come as key phrases. Direct links, in their turn, contain clear URLs of websites, words like “here”, “at the website”, “now”, brand name or image links. Niche and Non-Thematic Links. These are links published at the websites belonging to your niche and those that don’t have any relation to your website at all. If you wish to get links to your website, you’ll have to master the techniques of cooperation with other webmasters, bloggers and journalists. This approach is known as “outreach”, that is, the method of establishing relations and achieving agreements with the purpose of getting links in articles, banners or any other ways. Link building is closely connected with outreach – the search of suitable websites for posting links and holding negotiations with entrusted people. Your competence in establishing distant relations frequently has notable impact upon the cost and terms of link publishing. Step1. The first thing you should do is to get a list of niche websites.This can be done with the help of ahrefs, another similar service or manual Google search. The latter method requires experience and skillfulness in mastering the search formulas – the way of comprising direct search queries. You can find their full description on the web. This is how you will get a list of websites that mention an outreach opportunity in the URL or title. Step 2. Right after you compile a list of interesting websites, you have to analyze them. What you should do is to assess the parameters of materials (reviews, ads, banners etc.) and find opportunities to post articles on them. Step 3. Then you need to prepare the emails you will send to the administrators of the chosen websites. This is a separate task – conduct Google search to find out how to write them. We should just underline that these emails should be personalised as much as this is possible. When composing an email, mention the web master’s name (if you know it), the list of resource specifications in the context and other things you consider important. You have to create groups in popular social networks and post news linking to your website pages there. This approach works great granted that you have well-promoted groups. The more social networks you use and the larger the groups are, the better the effect is. This is obvious. YouTube should be mentioned separately. If you have a channel with users, you can add a link to it to boost its link juice. Increase the number of videos and link to your website and social network groups in their descriptions. It is also possible to talk to the owners of the niche channels about getting links to your website. Links from comments should also be referred to this section. It is not difficult to write them, but it’s complicated to find websites, the links from which will be valuable to you. The quality of posts should also be on a high level. Otherwise, the moderators will delete your comments. You can also register your website in local catalogues, niche resources and other aggregators. This is useful for a local business. Before registering in such a catalogue, you need to check its parameters. There are multiple services used for this purpose. Just enter the “wicheck website quality” phrase in the search engine and choose any of them in the TOP list. It doesn’t make any sense to publish information on websites that are under Google penalties and have poor parameters. It is reasonable to post less, but to make sure the platforms are of high quality. The benefits of this method are its free nature and relative simplicity of getting a link. When it comes to website promotion, Wix doesn’t differ a lot from any other website builder. What you should mind here is the interface, not more. Different systems may have diverse dashboards, the order of placement, formats of tool presentation etc. The essence, however, remains the same. Similar methods of search engine optimization are applied to the website promotion. The effort required for effective website promotion depends upon its type and niche competition. What matters most is the content. If it is available at the website, then it will have decent results even without external links. The more content is presented at the website and the higher its quality is, the better the web pages will be ranked. External optimization helps improve website promotion effect. The essence of websites’ SEO in Google goes down to the fact that the search engine focuses on content quality, reacts to the behavioral factors and considers external links quality. Without them, your website won’t be able to get to the TOP. Generally, quality and regularly updated content, mastering outreach techniques and well-promoted profiles in social networks is what you need to reach success. This is a surefire combination of key factors that works well both for Wix-based websites and those built with other website builders.